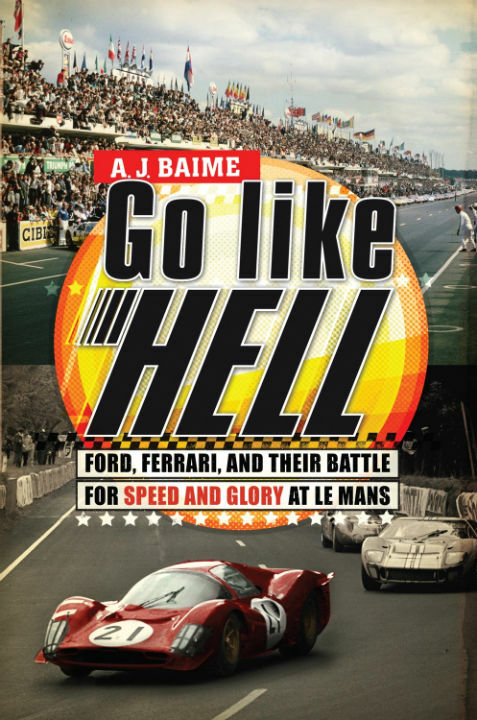 Go Like Hell tells the remarkable story of how Henry Ford II, with the help of a young visionary named Lee Iacocca and a former racing champion turned car builder, Carroll Shelby, concocted a scheme to reinvent Ford Motor company. They would enter the high-stakes world of European car racing, where an adventurous few threw safety and sanity to the wind. 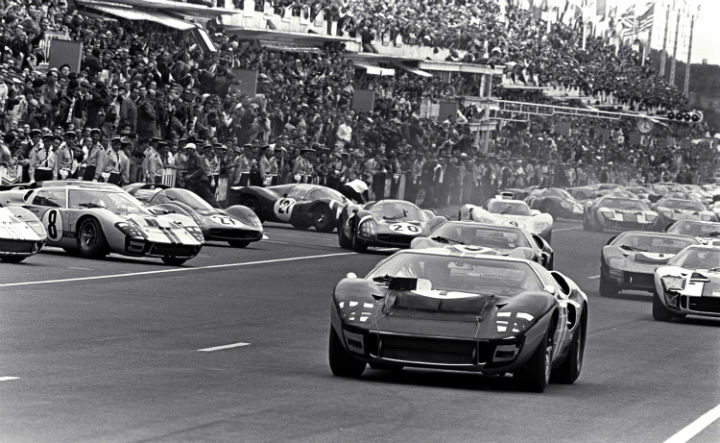 They would design, build, and race a car that could beat Ferrari at his own game at the most prestigious and brutal race in the world—the 24 Hours of Le Mans—something no American car had ever done. Have you ever been involved in a business war? Whether it’s Coke vs. Pepsi, Apple vs. Microsoft, or CBS vs. NBC, it seems that it always turns personal. So it was in 1963, when Henry Ford II’s acquisition of Enzo Ferrari’s company fell apart. Soon, the corporate giant and the boutique coachbuilder, and their enigmatic leaders, would do battle on the international sports car stage. This is the backdrop for Go Like Hell, A.J. Baime’s new book in which billion-dollar Ford is the surprising underdog in its quest to defeat financially struggling Ferrari. Baime’s book is a “non-fiction novel” that deftly combines pacing, suspense, and beautifully constructed prose to describe real events and characters. The business deal gone bad and Ford’s withdrawal from the Detroit Safety Resolution (enabling it to leverage racing in a “win on Sunday, sell on Monday” marketing strategy) provide the context for the story. Shelby took over the GT40 program in December 1964, and named Ken Miles as his development driver. After banging around Southern California racetracks for a decade, 46 year-old Miles was finally getting his big break. He responds with guts and supreme effort; Mark Donohue singled Miles out for praise in describing the great balance of the GT40. 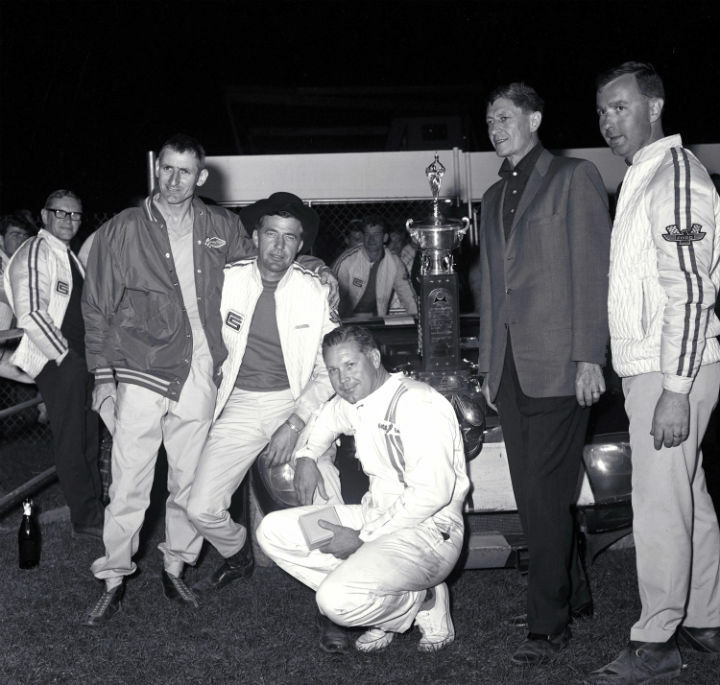 Ford hired a lot of big-name drivers, but Miles was not to be denied. 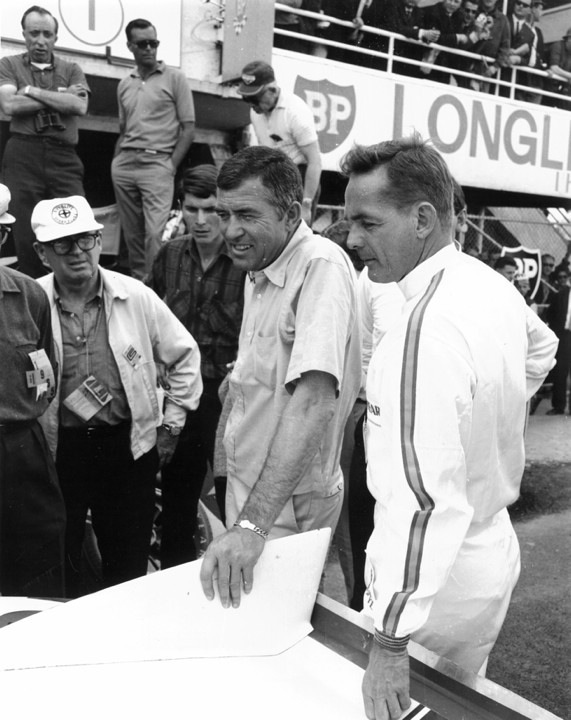 He and Lloyd Ruby gave Ford its first victory in the 1965 Daytona endurance race. But Miles had lousy luck: the next year at Le Mans, he was ordered to back off so that Bruce McClaren’s team car could catch up to him for a “photo finish”. The race officials then bumped him down to second on a technicality. After being screwed out of a win, Miles went back to work and died tragically two months later in a testing accident. Baime clearly put in the time and effort to research this story: he cites personal interviews with most of the surviving players, and provides an appendix with 23 pages of source notes. I noted only two errors, both coincidentally on page 175: Marco Andretti is Michael’s son not Mario’s, and John Surtees crashed in a Lola T70 Can-Am car at Mosport, not an F1 car as implied here. Go Like Hell ends with Ken Mile’s death following Ford’s 1966 Le Mans win. This allows the book to finish with the climax of Ford’s triumphant victory, but it felt premature to me. The story continued on, and the book would be more complete if it described the factory’s win with the Mark IV in 1967, as well as the wins by John Wyer’s private team in 1968 and 1969, the last year that the Fords competed. Baime also chose to gloss over or ignore many of the interesting technical challenges and racing subplots. For example, the serious problems with disintegrating brake disks described in The Unfair Advantage gets only a cursory mention here. The idea is to keep the book moving so that it appeals to a broad audience, but I kept wishing it would slow down and take me deeper into the story. So the biggest problem with this book is that it’s too short! The text is 256 pages long, with preliminaries occupying the first 60 pages before we even get to the Ford-Ferrari confrontation. With an additional hundred pages to flush out and complete the story, Go Like Hell would be a satisfying meal rather than a light snack. Go Like Hell because it reminds us of what’s possible when leaders focus resources and commitment on a goal, and refuse to fail. 4 American Racing Wheels, out of 5.
or is it ok to do more racing stuff? Let’s not forget Porsche’s 16 wins there….or the recent long haul by Audi. By the way, do we know Porsche’s streak should actually have been 17 but a “technicality” loss ending up in Porsche 2nd place finish, was not contested one year? Teaser !…involves a win for a certain French car that was seen by Porsche as being a particulary unpopular move if contested, recignizing the valiant effort of the French car team that year ! ( Another hint…the French team that “won” had previously been having transmission issues in other races and for LeMans, purchased a Porsche box for winning effort. What further irony ! Lee Robie is computer programmer, writer, and lifelong auto enthusiast. He raced for several years, finishing third in the Skip Barber Midwest series, but found that the thrill of victory was often exceeded by the agony of a broken checkbook. He counts Mark Donohue, A. J. Foyt, and Gilles Villeneuve among his all-time favorite drivers, and would drop everything to write (or even read) Roger Penske’s life story. Lee lives outside of Cincinnati, Ohio with his wife Penny, two grown children, and an assortment of animal companions.